" Absolutely thrilled with the results of Mr Paun’s work on my new nose. He is a young, on the ball, expert in his field and I didn’t once feel nervous before or after the surgery. His team and assistant Mo, were so friendly and helpful. I can highly recommend him as a surgeon. " Just wanted to say a massive thank you for my nose! The fact that I am still so bunged up but can feel air going into both nostrils is life changing. As for the shape of my nose, I came to you so unsure of what I wanted. I almost wanted the impossible...'make me look a little better but not so much as to look different'. What an impossible task..even I didn't know what I wanted. I looked at my side profile in the mirror once I left your surgery and said to my husband for the first time in my life "I think I am quite pretty". I hope that doesn't make me sound vain but I have never looked at myself in that way before. Somehow...on the complete opposite end of the spectrum, when I look in the mirror, I can almost forget I did the surgery because it was such a gentle and subtle change that even my own children haven't even noticed. We still have a few weeks to wait till things settle, it looks very slightly uneven at the tip but I think it is just the swelling. THANK YOU THANK YOU THANK YOU!! " 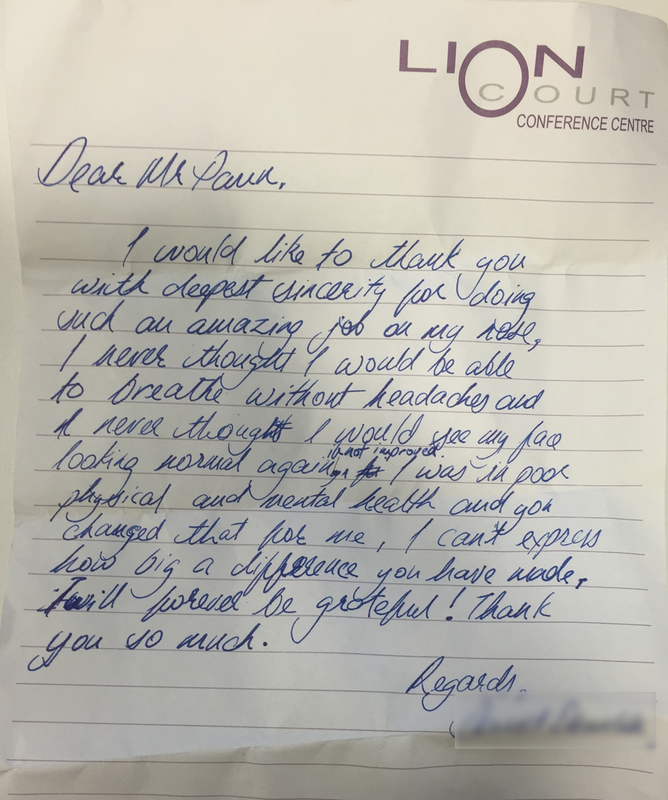 " My experience with Dr Paun and his team was a very positive one. From diagnosis through treatment and aftercare I was taken care of extremely well. Dr Paun's team worked hard to find appointments at times that suited me and I was very impressed with the speed and efficiency of the process. I was very confident in Dr Paun's hands for the treatment and surgery itself and found him very helpful, reassuring and professional. Overall, I recovered quickly and would certainly recommend him and his team. " " I just wanted to let Mr Paun know that despite looking a bit perturbed when the cast came off, I am really pleased with the outcome so far. As the swelling continues to come down, I can see what a fantastic job he has done. I was initially worried I didn't look like "me" but as the swelling is reducing and the bruising is going, I can see it is still my nose, just lovely straight version of it. Having lived with my old squint nose for 32 years, it was just a shock to see it straight! " " Allow me to convey my sincerest thanks and appreciation both for the surgery you carried out on both my ears, and for doing the surgery and having the follow-up so promptly. Although I did manage to extend my stay through the goodwill of colleagues in Indonesia who swapped lectures with me, I much appreciate your willingness to see me the day after I arrived in London and to do the surgery a few days later." Mr. Paun operated on me ten months ago. I wanted to help the community by sharing my thoughts/experience for anyone out there researching which Surgeon they should select. Trust me, I was in your shoes - I know it's not an easy task selecting a Surgeon. With many to choose from, It can be overwhelming finding the one you feel most comfortable to have operate on you. Some clinics charge half the price of others, while some focus more on advertising. You should also not let others' fancy pre-operation prediction softwares fool you. All the software and technology can be used, but the best predictor of ones' results is the experience of a Surgeon. Knowing that Mr. Paun lectures across the globe, and performs more operations a year than most Surgeons, choosing him as my Surgeon was a no brainier for me. He was very honest and humble. It left me leaving my consultation with a good gut feeling. Ten months post-op, I couldn't be happier with the results of Mr. Paun's work. The outcome is so natural not one person has yet to notice without me telling them. You can read as many reviews out there (which I highly encourage), but your gut instinct you get during/after consultations will be the best determinant of which surgeon to select. " " Mr Paun, my Hero. I've always been unable to breathe through my nose and was very unhappy with the shape. I disliked having my photo taken because my nose looked rather wonky. 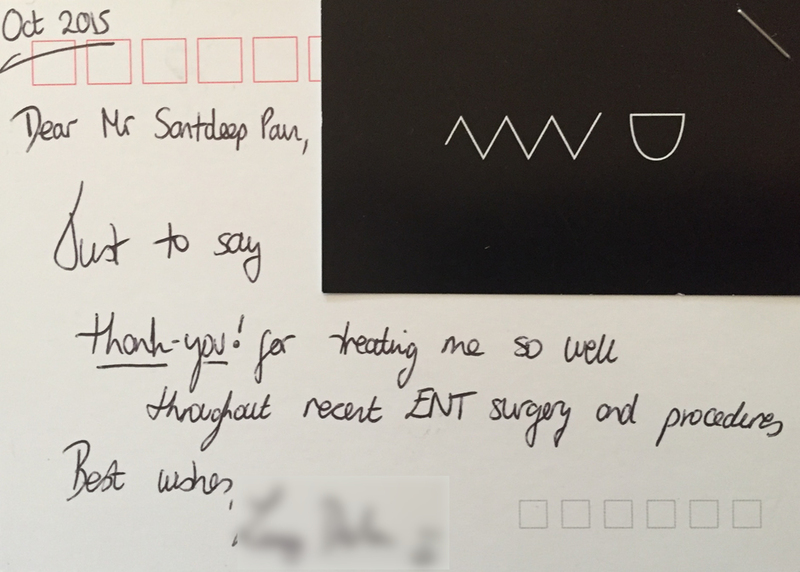 I saw Mr paun for a consultation and was really impressed with his professional manner. 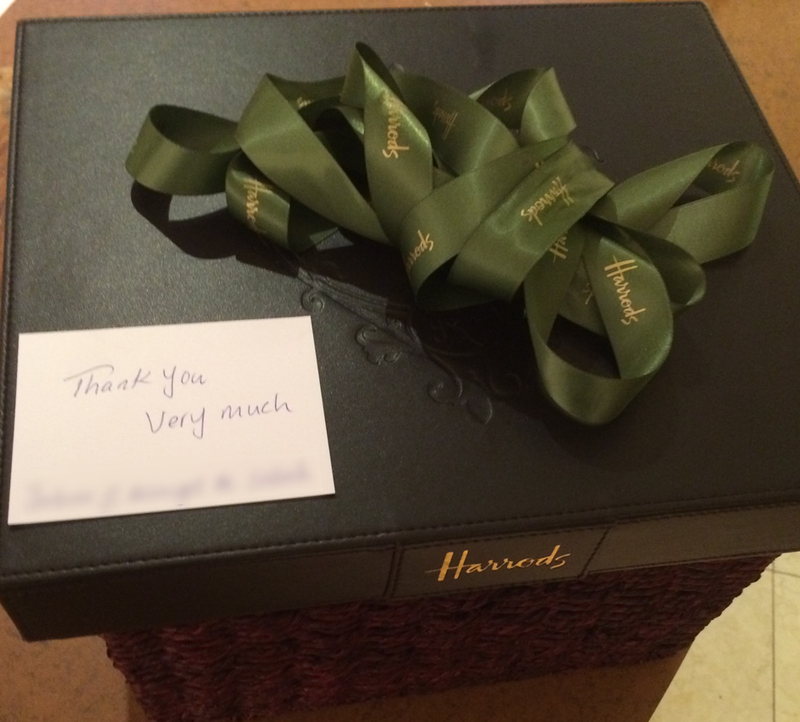 He explained the procedure thoroughly, listened to my concerns and gave his opinion on what he thought would suit me. He made sure I understood all the possible risks/limitations and I left feeling extremely well informed and happy. On the day of the surgery, I felt really comfortable and confident that I had Mr Paun as my surgeon and he once again made sure I was happy to go ahead and answered all my questions. I had minimal bleeding from the nose and some bruising which was to be expected after the operation but it wasn't as a bad as I had imagined. Once the plaster was taken off, I was in awe of Mr Pauns handiwork. I am absolutely in love with my nose. I can finally breathe through it and it looks perfect to me! It's straight, pretty and the scar is only visible when I point it out. I highly recommend Mr Paun. " " I was referred to Dr Santdeep Paun back at the end of 2012 to have my nose re-aligned and discuss Rhinoplasty surgery which I had considered for years but never had the courage to go ahead with it. I was immediately at ease and my mind put at rest upon meeting him, such an intelligent, yet humble individual. We discussed the procedure in detail as I really wasn't happy with my nose, and went in as a day patient at the Harley Street clinic. The team were so friendly and his Personal Assistant, Momotha Amin was very helpful. Surgery was around 2.5hrs and upon waking I knew I was in safe hands and couldn't wait to see my new nose! Recovery was around two weeks for the swelling go down so if your able to work from home please do so! I had my follow up and stitches removed and apart from minor swelling I was overwhelmed with the results. It took a year for all the swelling to go away completely but I can honestly say it was the best decision I have every made. 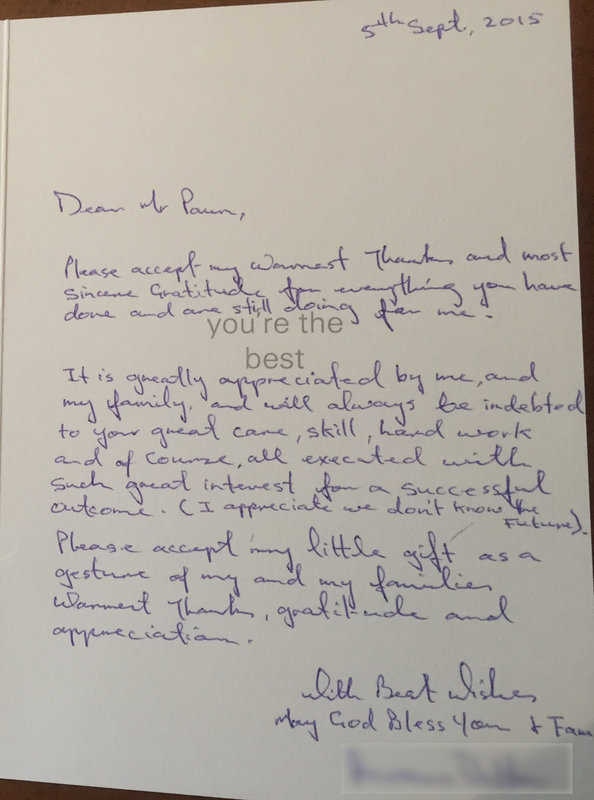 I can highly recommend Dr Santdeep Paun as a gifted surgeon with the ability to also have a good "bed side manner" with his patients which is very hard to find in this industry. Thank You! Thank You! " " I needed revision surgery due to an unsuccessful surgery performed by another surgeon. I had difficulty breathing through my nose and ascetically it was crooked and there was a hump on the nasal bone. I was very nervous about going through the procedure due to a previous surgeon letting me down. I couldn't breathe properly through my nose after having it broken playing sports. It was also very obviously deviated. The operation corrected the deviation and I can now breath. I was apprehensive about getting the procedure done but Mr Paun explained everything very well, putting me at ease prior to the procedure. Post the operation the aftercare and advice was great. Pain was limited and the outcome of the operation was perfect. "